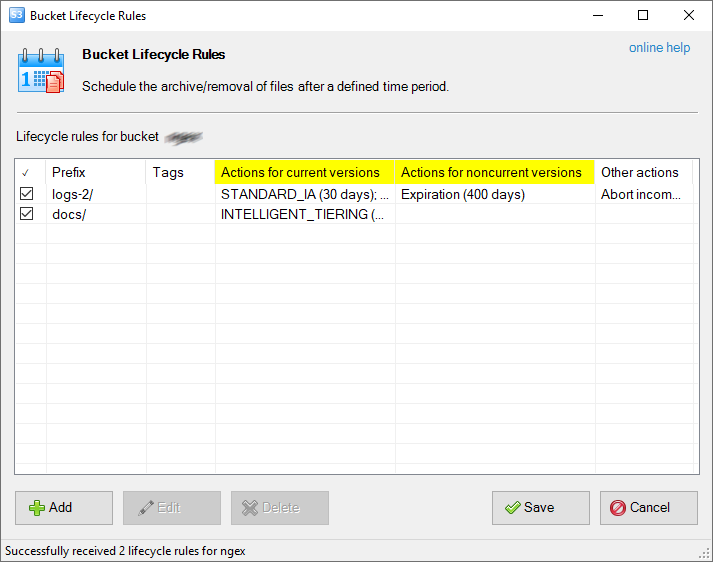 Managing Amazon S3 Bucket Lifecycle Configuration. 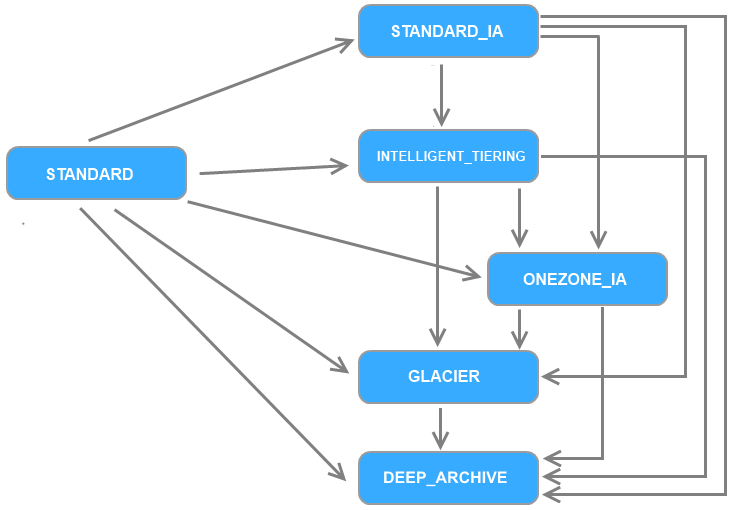 Transition from Amazon S3 to Amazon Glacier. Schedule removal of files. 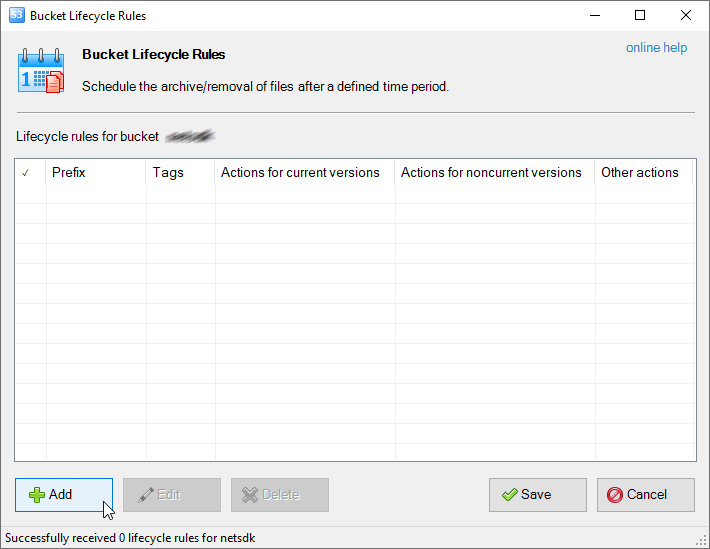 Bucket Lifecycle Configuration. Object Expiration. Transition to Amazon Glacier. 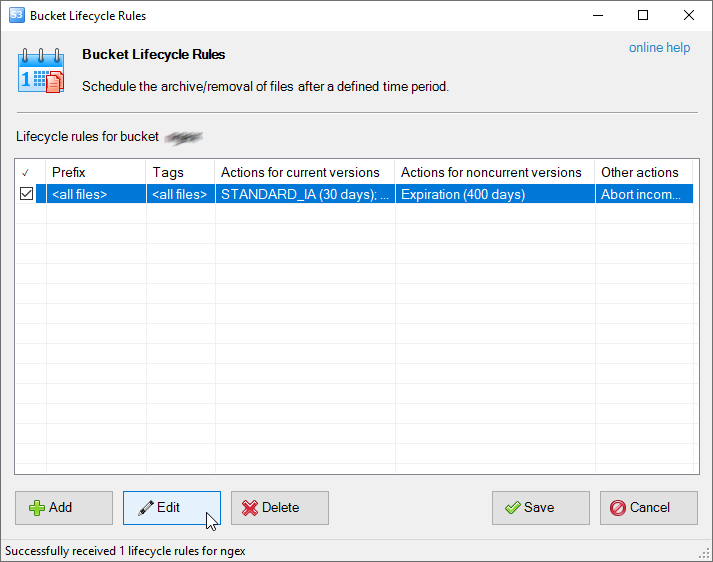 Lifecycle rules allow you to manage objects lifecycle. 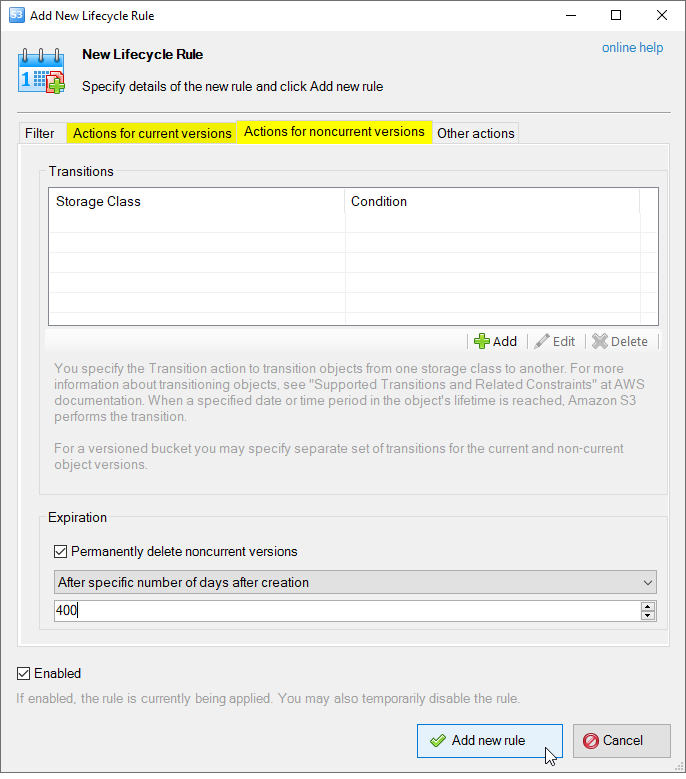 With lifecycle configuration rules, you can tell Amazon S3 to transition objects to less expensive storage classes, or archive or delete them. Expiration defines when objects expire. Expired objects are automatically deleted by Amazon S3. Abort incomplete multipart uploads allows you to delete multipart uploads that are not successfully completed within the predefined time period. Remove expired object delete markers - in a versioning-enabled bucket, a delete marker with zero noncurrent versions is referred to as the expired object delete marker. Filter - identifies one or more files to which the rule applies. You may filter the objects by prefix and/or by one or multiple object tags. Condition - defines when the rule should apply, you may specify the condition based on an object's age or on a specific date. 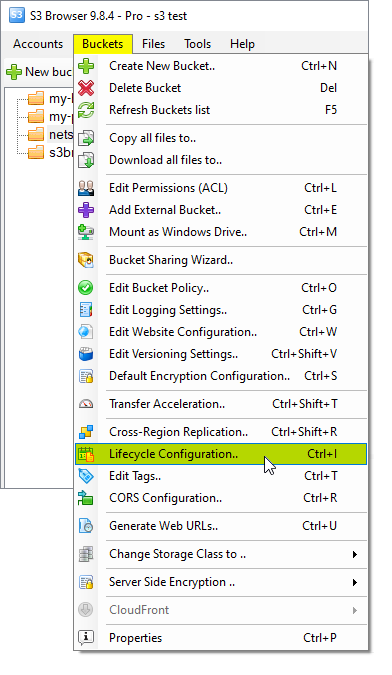 Select the bucket and click Buckets, Lifecycle Configuration.. Or use the CTRL+I keyboard shortcut. 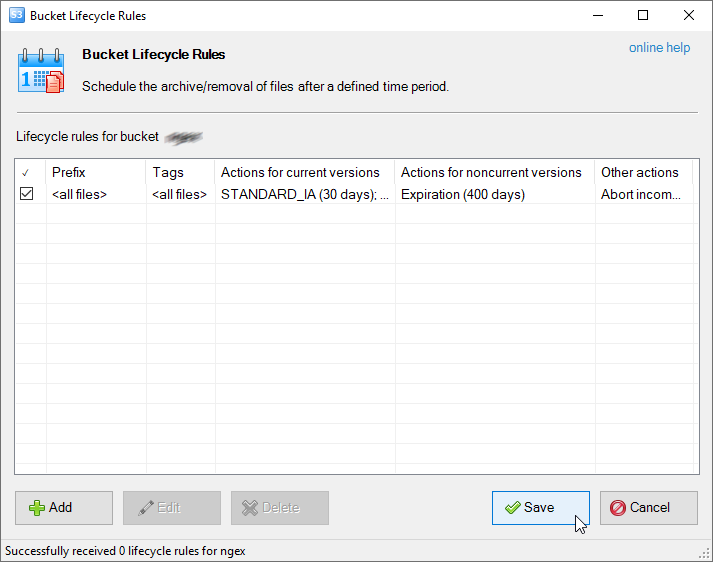 Bucket Lifecycle Rules dialog. Click Add or use the Insert keyboard shortcut. Filter - the page where you define the filter. 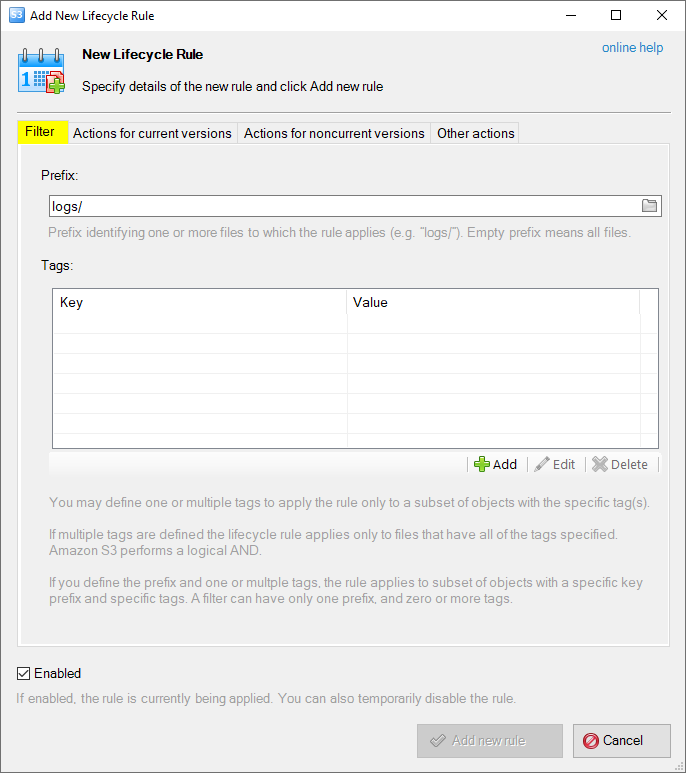 The filter identifies one or more files to which the rule applies. Actions for current versions - the page where you define transition and expiration actions for current object versions. Actions for noncurrent versions - the page where you define transition and expiration actions for noncurrent object versions. Other actions - the page where you configure other actions such as uncompleted uploads abortion and removal of expired delete markers. You may define the filter based on the object's prefix and/or by one or multiple object tags. Prefix - identifying one or more files to which the rule applies (e.g. 'logs/'). Empty prefix means all files. Tags - You may define one or multiple tags to apply the rule only to a subset of objects with the specific tag(s). 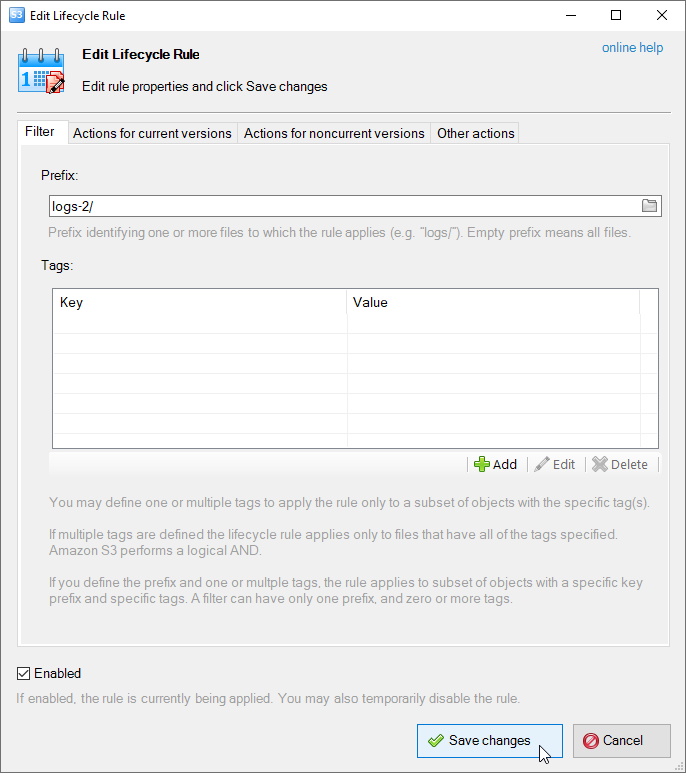 If multiple tags are defined the lifecycle rule applies only to files that have all of the tags specified. Amazon S3 performs a logical AND. If you define the prefix and one or multple tags, the rule applies to subset of objects with a specific key prefix and specific tags. 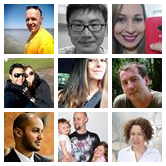 A filter can have only one prefix, and zero or more tags. Transitions - You specify the Transition action to transition objects from one storage class to another. For more information about transitioning objects, see "Supported Transitions and Related Constraints" at AWS documentation. 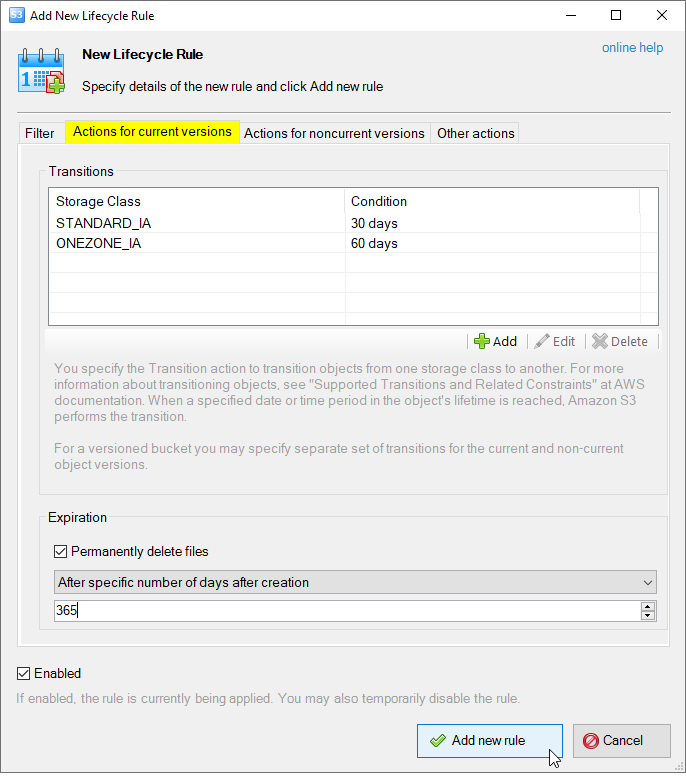 When a specified date or time period in the object's lifetime is reached, Amazon S3 performs the transition. Expiration - Allows you to permanently delete the objects after specific number of days after creation or on a particular date. Check out AWS documentation to learn more details on how Amazon S3 calculates the object's age. Important: The date-based action is not a one-time action. S3 continues to apply the date-based action even after the date has passed, as long as the rule status is Enabled. Abort uploads that are not successfully completed - Use this option to set a maximum time (in days) that you want to allow multipart uploads to remain in progress. 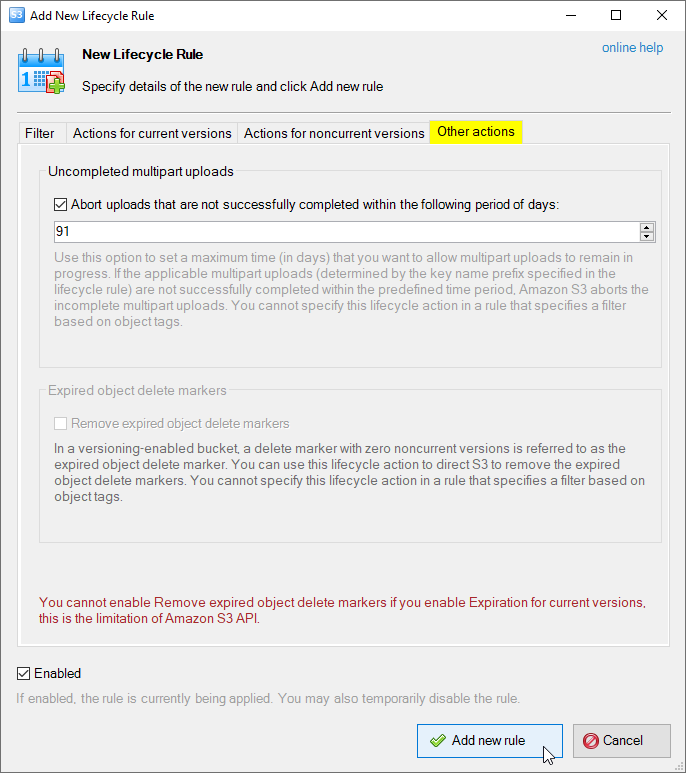 If the applicable multipart uploads (determined by the key name prefix specified in the lifecycle rule) are not successfully completed within the predefined time period, Amazon S3 aborts the incomplete multipart uploads. You cannot specify this lifecycle action in a rule that specifies a filter based on object tags. Remove the expired object delete markers - this option is available for versioned buckets only. In a versioning-enabled bucket, a delete marker with zero noncurrent versions is referred to as the expired object delete marker. You can use this lifecycle action to direct S3 to remove the expired object delete markers. Add New Rule - Click Save to submit your changes to Amazon S3 or use the CTRL+S keyboard shortcut. 5. Click Save to submit your changes to Amazon S3. Select the rule and click Edit or use the F2 keyboard shortcut. 2. Select the rule and click Edit. 4. Click Save to submit your changes to Amazon S3. Select the rule(s) you want to delete and click Delete or use the Delete keyboard shortcut. 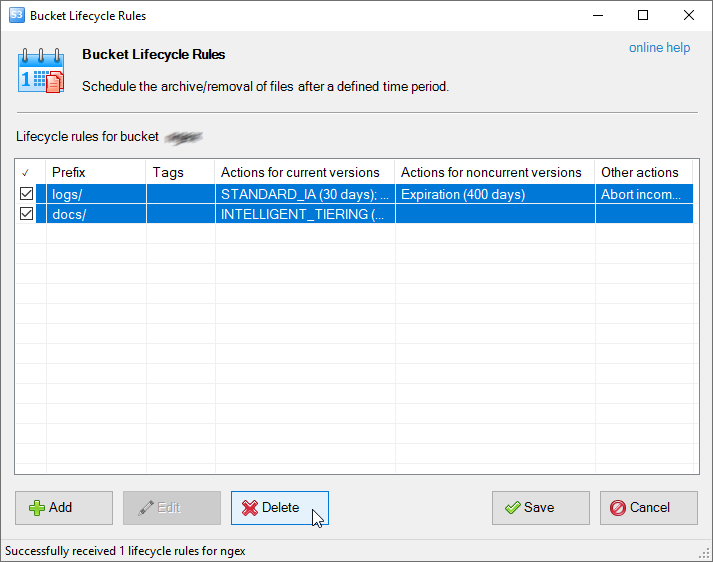 The recently announced support of lifecycle rules for versioned buckets is now implemented in S3 Browser. You can now configure expiration and transition actions for object versions as well. Lifecycle rules editor was updated accordingly. If you adding lifecycle rule for a versioned bucket, there will be two tabs: Current Versions and Previous Versions. You can specify separate actions for current and noncurrent versions.